Vegans eat exclusively plant-based food. In other words, they do not eat animals or animal products. But there is much more to a vegan way of life than diet. Whether it’s caring for animals, the environment, or one’s own health, there is a multitude of reasons to choose a vegan lifestyle. ProVeg explains more about vegan diets. Why choose a vegan diet? It is becoming increasingly clear that the consumption of animals is a major contributor to numerous global problems. Since a plant-based diet provides a single solution to helping resolve all of these problems, the move towards a diet and lifestyle free from animal products is rapidly gaining momentum. A plant-based diet saves many animals from a life of suffering, reduces one’s personal ecological footprint, and can contribute to a fairer world. At the same time, plant-based eating can also offer a healthier and more varied diet. Throughout history, vegetarianism has always played a role, whether for religious, political, or social reasons. The concept of vegetarianism and veganism goes back at least as far as 6,000 years, with the first records originating from Indian cultures. But even in Europe, 2,500 years ago, certain schools of Greek philosophy rejected the consumption of meat, eggs, and milk for ethical reasons, while also recognising that a solely plant-based diet was healthier. The term ‘vegan’, however, only emerged in 1944 and is based on the beginning and end of the word ‘veg-etari-an’, which reflects the idea that veganism starts with vegetarianism and carries it through to its logical conclusion. Vegetables and fruits such as tomatoes, cabbage, beetroot, pumpkin, garlic, olives, broccoli, apples, nectarines, berries, bananas, melons, and oranges. These kinds of food are an important source of vitamins, minerals, phytonutrients, and fibre. Pulses such as lentils, peas, beans, soya beans, and lupins, which are a key source of protein. Whole grains and cereals such as oats, rye, spelt, wheat, barley, millet, and rice, along with pseudocereals such as quinoa, amaranth, or buckwheat. These provide complex carbohydrates, fibre, and phytochemicals. Nuts and seeds such as flax seeds, walnuts, sunflower seeds, and hemp seeds, which provide healthy fats as well as a range of other valuable nutrients. Vegan meat alternatives such as tofu, vegan burgers, schnitzels, and sausages are available in many variants – for example, based on soya, seitan, or lupines. There are also many vegan alternatives to milk, yoghurt, or cheese. These are often based on soya, nuts, or cereals. The vegan food plate offers a simple guide to healthy vegan nutrition. The composition of the vegan plate corresponds to current scientific knowledge regarding the health effects of what we eat and drink on a vegan diet. Meat and poultry that comes from animals such as cows, pigs, horses, chickens, and turkeys. Fish and other marine animals, including all fish species, squids, mussels, crabs, and lobsters. Dairy, such as milk, cheese, yoghurt, and butter. Eggs, such as chicken eggs and caviar. Honey and other bee products. Animal-based ingredients, such as gelatine, lactose, whey, shellac, carmine, and fish-derived omega-3 fatty acids. The high consumption of animal products is one of the main causes of widespread lifestyle diseases such as obesity, diabetes, and cardiovascular disease. A varied and balanced plant-based diet can help minimise the risk of developing these diseases. In its position paper on the subject, the Academy of Nutrition and Dietetics writes that a well-planned vegan (as well as vegetarian) diet is suitable for all phases of life, including pregnancy, infancy, childhood, and adolescence. Furthermore, a plant-based diet reduces the risks of foodborne illnesses from salmonella and other bacteria, as well as exposure to environmental toxins. With every diet – whether vegetarian, vegan, or non-veggie – good planning is essential to avoid nutritional deficiencies. Optimal nutrition is ensured by eating a balanced and varied vegan diet while paying attention to critical nutrients. Nutritionists also recommend having a blood test done every year or two. In order to meet one’s calcium needs, one should deliberately consume calcium-rich plants (for example, dark green vegetables, leafy greens, soya beans, tempeh, tahini, oats, citrus fruits, nuts, seeds, and raisins), calcium-rich mineral waters, and calcium-fortified products (for example, plant milk). According to the World Health Organization (WHO), about a third of the world’s population is affected by insufficient iodine intake. In Europe, as much as half of the population is affected.1WHO (World Health Organization) (2004): Iodine status worldwide: WHO global database on iodine deficiency. Geneva, p. 1, 12 The body can receive an adequate supply of iodine by consuming algae or algae-based supplements such as spirulina, or adding iodised salt to one’s diet. However, an overdose of iodine can cause health problems. People who prefer to experiment in their own kitchen instead of buying animal-free ready meals are finding an increasing selection of great recipes in cookbooks and on blogs. 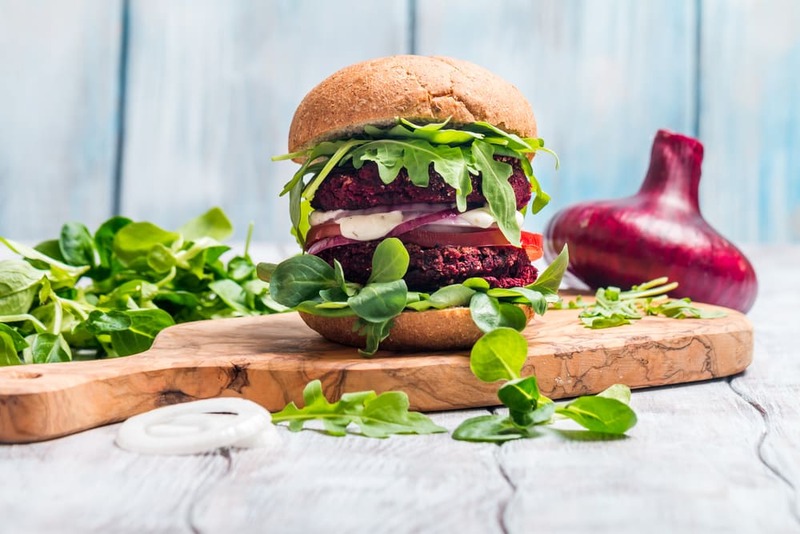 Whether it’s gourmet food lovers, fast-food fans, or chefs who like to experiment – the colourful variety of plant-based cuisine has something for everyone. And while people are often afraid of giving up their favourite dishes, many traditional meals can be easily veganised with a few tweaks. As countless vegan cookbooks attest, a vegan diet promises pure enjoyment and satisfaction for the taste buds. More and more consumers are questioning the consumption of animal products. This is also reflected in the increasing demand for plant-based alternatives. Plant milks, for example, have been consumed for centuries in various cultures, but their popularity has skyrocketed over the past decade. Additionally, cruelty-free substitutes (such as vegan sausages or burgers) are improving all the time and it is increasingly difficult to tell them apart from the ‘original’. ProVeg is particularly committed to the theme of taste. On an individual level, we constantly show people new ways to enjoy plant-based food, point out healthy, cruelty-free alternatives, and support them in their implementation. Apart from raising awareness, we invest a lot of resources into creating a facilitating environment. On an institutional level, ProVeg vigorously promotes the development of great-tasting plant-based food by supporting and advising innovative companies that want to enrich the veggie market with their product. We work with caterers, chefs, businesses, and producers to improve the availability and quality of plant-based alternatives. For many, veganism is not just about their diet but applies to all aspects of their lives. A vegan lifestyle includes, for example, avoiding clothes which contain animal products such as leather, wool, or fur, and cosmetics that contain animal products such as honey or lanolin or which have been tested on animals. Fortunately, the range of vegan clothing and animal-free cosmetics is also growing and becoming increasingly available. Vegans also seek to avoid all other forms of animal exploitation and cruelty, including visiting zoos or circuses for entertainment. To do so, one does not have to change overnight to living a life that is 100% plant-based. Just get started. Incremental changes to one’s diet should be made as easy as possible, which is why ProVeg provides a great deal of information about the advantages of plant-based cooking and tips for a change in diet and lifestyle. Try a few simple recipes and find out why more and more people worldwide want to live a plant-based life. Join the global plant-based movement and benefit from the numerous advantages of a healthy, climate-friendly, and compassionate diet.